﻿Well, friends, I hope you all had a wonderful summer and are getting back into some good routines for the fall and winter coming up. It seems I unintentionally took August off, however, I was doing some small projects(like some cleaning in my studio which still needs some more done), and taking care of my Mom. I decided to pull out some of the Gelli prints I had done in Carolyn's first class where she shared a mermaid design from her daughter. What really sparked this page was a piece of an add from some junk mail with the fish and the text-it is different. The fish just went with the mermaids and bubbles. The mermaids on the right page were printed on an old phone book page and on the left page it started out as a ghost print straight into the journal. I added to the text to read-- it is different to stand out in a crowd. Then on the next page--Don't be afraid to be an individual. I used clear gesso, 3 colors of blue Gelatos, some hot pink acrylic paint, some white acrylic paint, a Sharpie white paint marker, a black Sharpie fine marker, a white Stabilo pencil, a stamp set from Stampin' Up, and ACS026 bubble stencil from Artistcellar. I didn't go to the beach this summer, but I finished it off with an under the sea theme. Now it will be time to start the holiday whirlwind with Halloween and Christmas. Where has this year gone? I love these pages! 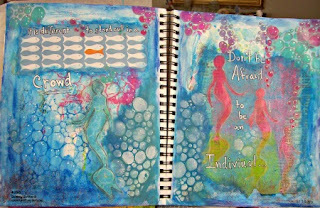 The story behind how you were inspired- one of my favorite things about art journaling is that things get connected out of the blue- like the ad did for you! And the layers- the colors- and the mermaid! Can't wait to show my daughter! So glad you shared this with the party! I love your pages and that you used things you made in Carolyn's class!